This tutorial was originally written by atom0s. 1.1 How many characters can I migrate to HomepointXI? 1.2 I play on 'x' server, will this work for me? 1.3 How does this work? 1.4 What, if any, limitations are there? What will be imported from my profile? 1.5 I imported my profile before, and now you support 'x'. Can I have that imported from my previous export? This topic is to serve as helpful information regarding the server transfer application and process that is now part of HomepointXI. Please note that all of this information is subject to change at any time, without warning. This process and tool(s) used to make it happen are new and will be in the works for a while to fine-tune things and tweak them just right to HomepointXI's standards. I am personally working with the HomepointXI staff to bring this tool to their server to offer players of other servers the ability to come and play on HomepointXI but without losing [most] of their hard-work from other places. What is this for? What does it mean? What what what..? Server transferring is for players who wish to move their current character from another server to HomepointXI's server. Server transferring helps prevent having to start from ground zero with a new character, leveling, gearing, etc. 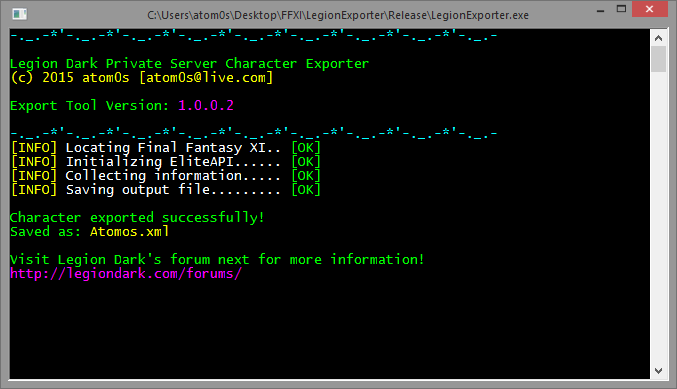 Instead, with the HomepointXI Private Server Server Character Exporter tool, users can export their current character data from one server to HomepointXI. With the simple click of launching an application, you are seconds away from beginning your transfer process! How many characters can I migrate to HomepointXI? As of 5/7/2016 we allow you to transfer only 1 character through the transfer process. Anyone found abusing this rule will be subject to character and item deletion and will no longer be allowed to use the character transfer process. I play on 'x' server, will this work for me? What, if any, limitations are there? What will be imported from my profile? Your character name will be imported. However if the name is taken, we will use a different name of your choice while importing. Your race / hair style will be imported. Your model size WILL NOT be imported. Your main job level that you are currently on will be imported, up to level 99. Your nation will be imported. Your rank WILL NOT be imported. Your limit and merit points will be imported. Your spent merit points WILL NOT be imported. Your main job level that you are on at time of export will be imported, up to level 99. All other jobs will be imported up to level 75. This means if any job you have is 76+ it will be capped to 75. So if you had every job at 99 on another server, only your main job you exported your data on will be 99, the rest will be capped to 75. NOTE: Even though you can transfer over your main job at whatever level (up to level 99) it was at time of export, and all other jobs higher than 75 capped at 75, you MUST still beat Maat here for the capped jobs/lower level jobs to level higher than level 75/70 (respectively). Your inventory, safe, storage, locker, satchel, sack, case, and wardrobe items will all be imported. Any armor / weapon over level 75 WILL NOT be imported. Any relics / mythics / etc. WILL NOT be imported. Various items do not work or are missing on private servers. Any item missing from the database WILL NOT be imported. Because of how the client handles this data, at this time only the skills present on your main character will be imported. In a future version of the export tool, this may be adjusted to work with all skills across all jobs etc. But for now just the main job you are on at the time of the export will have its skills dumped. Craft skills WILL NOT be imported. Instead, after your character is imported, contact a GM to have one of the craft levels from your exported profile restored. Spells (whether they are already learned or in the form of scrolls in inventories) WILL NOT be imported. I imported my profile before, and now you support 'x'. Can I have that imported from my previous export? Because of how the client handles this data, at this time only the combat skills present on your main character will be imported. In a future version of the export tool, this may be adjusted to work with all skills across all jobs etc. But for now just the main job you are on at the time of the export will have its combat skills dumped. Instead, after your character is imported, you must open a ticket on Github to have a GM restore the level(s) of your craft(s) from your exported profile. If you are transferring from a retail server, one craft skill higher than 60 (but not to exceed 100) will be restored. All other sub-crafts over 60 will be limited to level 60 for the transfer. If you are transferring from another private server, only one craft skill will be transferred. In either case, you must specify, in the Github ticket, which craft skill (if there are multiple) is the one that is to be set. Log fully into your character on whichever server you wish to export your character from. Make sure your client has finished loading the character, this can several minutes (depending on your connection speed) after your character is able to move around in the game world! You must use Ashita to load into your character on the server you wish to export your character from. Usage of Windower for this purpose does not work!!! Switch to the main job / sub job that you specifically play the most and want to be your fully exported job. Rename the exported character profile file to the name of the character you wish to import it to on our server. If you have craft information you wish to have imported, please take a screenshot of your craft levels! Create a new character on our server with the name you wish to import the character to. (It should match the name you made the exported profile file!) DO NOT LEVEL THIS CHARACTER PRIOR TO THE IMPORT BEING COMPLETED!!! In the new thread be sure to title it the name of the character you are importing. In the new thread include the following template (REMEMBER TO INCLUDE YOUR INFORMATION AFTER EACH LINE!!! DO NOT INCLUDE THE LEFT ARROW OR THE RED TEXT AFTER IT, THOSE ARE PROVIDED TO HELP YOU UNDERSTAND WHAT TO PROVIDE!!!). • Any additional information you feel may be needed or useful for your import: ← IT'S PRETTY SELF-EXPLANATORY WHAT YOU WOULD PUT HERE, IF YOU FEEL THE NEED. • Any screenshots of craft levels or other requested information a GM has asked from you: ← IT'S PRETTY SELF-EXPLANATORY WHAT YOU WOULD PUT HERE, IF YOU NEEDED TO/WERE ASKED TO BY A GM. Please Note: Before you export a character, disable all plugins/addons for Ashita, as well as any other third-party tools. For the best results, everything extra should be disabled! Please Note: You must replace furnishings and zone before items in you storage will appear. This page was last edited on 30 August 2018, at 19:01.